Corporate Boards: Managers of Risk, Sources of Risk deals with the highly timely topic of the Corporate Board and its relationship to risk, both in terms of its management and its creation. Robert W. Kolb has taught at the University of Florida, Emory University, the University of Miami, the University of Colorado, and Loyola University Chicago, where he currently serves as Professor of Finance and holds the Frank W. Considine Chair of Applied Ethics. Kolb is the author or co‑author of more than 50 research articles and 25 finance texts on topics including financial derivatives, investments, corporate finance, and financial institutions. He recently edited the Encyclopedia of Business, Society, and Ethics (2007). Kolb also founded Kolb Publishing, Inc., which published finance and economics university texts and was acquired by Blackwell Publishing, now part of John Wiley & Sons, Inc.
Donald Schwartz is Professor of Finance at Loyola University Chicago where he directs the Center for Integrated Risk Management and Corporate Governance and the M.S. in Finance program. Donald holds a Ph.D. from Purdue University. Prior to coming to Loyola, Donald was a Senior Executive with Chase Manhattan Banking Corporation and two subsidiaries of Cargill Incorporated. He has worked extensively with corporations and governments to design and execute market and financial risk programs. Part I: A Factual Basis. Part II: Is Risk Management by Corporate Boards Even Possible? Part III: Board Structure and the Management of Risk. 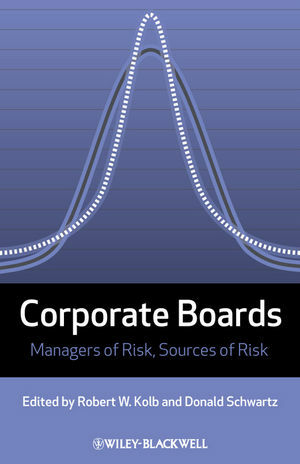 Part IV: Corporate Boards and the Management of Specific Risks. Part V: Corporate Boards, Risk Management, and the Ethical Firm.